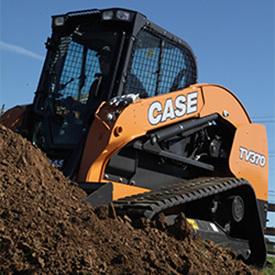 CASE introduces the TV370 compact track loader (CTL), a new 74-hp machine that combines a maintenance-free Tier 4 Final solution with the strength and reach of a large-frame CTL. The TV370 provides a 3,700-lb. rated operating capacity and a vertical-lift design that makes it ideal for loading trucks, and lifting and placing heavier palletized materials. The CTL is ideally suited for landscaping, utility, agricultural and rental applications where operators value lift capacity and strength, but may not require higher horsepower to run high-volume production attachments.